Jacob Rees-Mogg has suggested that the EU is a “mafia-style organisation” trying to “kneecap” Britain as punishment for Brexit. The Conservative Brexiteer accepted “there may be some problems” as a result of leaving the European Union but insisted it was a “stunning and exciting opportunity”. 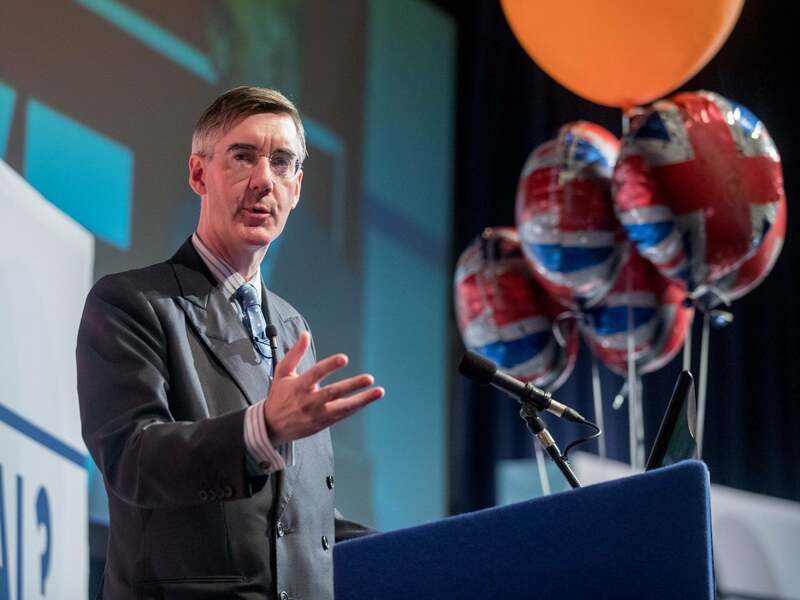 Mr Rees-Mogg, who was speaking to supporters at a Leave Means Leave rally in Torquay, also warned Theresa May that some 40 Conservative MPs were opposed to her Chequers deal. “There are probably 39 Tory MPs who are more tough-minded on this issue than I am,” said Mr Rees-Mogg, chairman of the Tory European Research Group. Mr Rees-Mogg concluded: “I’m afraid the government is now in the business of managing decline. It doesn’t think Brexit can be a success and therefore it must ameliorate the consequences. The Brexiteer’s comments came as Ms May faced pressure from her DUP parliamentary allies not to accept the EU’s backstop proposal over the Irish border problem. Democratic Unionist Party leader Arlene Foster warned the prime minister not to accept a “dodgy” deal which would “effectively cut Northern Ireland adrift”. Her party has threatened to cause a political crisis by voting down the budget if Ms May gives way to Brussels and Ms Foster said: “The DUP’s actions this week are not as some have suggested about ‘flexing muscle’. The EU’s proposal would see just Northern Ireland remain aligned with Brussels’ rules but is fiercely opposed by the Democratic Unionist Party, whose MPs have supported Ms May in Westminster. Royal Navy Commander, Nathan Gray lands his F-35B onboard HMS Queen Elizabeth for the first time. Two F-35B Lightning II fighter jets have successfully landed onboard HMS Queen Elizabeth for the first time, laying the foundations for the next 50 years of fixed wing aviation in support of the UK’s Carrier Strike Capability. Royal Navy Commander, Nathan Gray, 41, made history by being the first to land on, carefully manoeuvring his stealth jet onto the thermal coated deck. He was followed by Squadron Leader Andy Edgell, RAF, both of whom are test pilots, operating with the Integrated Test Force (ITF) based at Naval Air Station Patuxent River, Maryland. Shortly afterwards, once a deck inspection has been conducted and the all-clear given, Cdr Gray became the first pilot to take off using the ship’s ski-ramp. "It's either my deal or no deal", the Prime Minister has said to the BBC's Nick Robinson in an interview on Panorama. Mrs May also claims to be irritated by the constant speculation over her leadership, stating "this debate is not about my future. This debate is about the future of the people of the UK and the future of the United Kingdom." Mayor of London Sadiq Khan announced his support for a second Brexit referendum. In The Observer, the mayor writes: “After careful consideration, I’ve decided the people must get a final say. This means a public vote on any deal or a vote on a no deal, alongside the option of staying in the EU"
The Liberal Democrats party conference began in Brighton. In his conference speech, leader Vince Cable is expected to elaborate on his plans for a "Movement for Moderates"
The prime minister has suggested a “temporary customs arrangement” for the whole UK but Brexiteers fear it could trap the UK in the customs union permanently, with Mr Rees-Mogg claiming that “temporary means eternal”. Tory Commons leader Andrea Leadsom is said to be prepared to resign if Ms May compromises further ahead of a summit in Brussels next week.